Range: Bateleur eagles may be found in Africa south of the Sahara Desert, living on Mount Kenya and Mount Killmanjaro. Habitat: Bateleur eagles can be found in the open lands and brush savanna of Africa. Diet in the wild: Carrion (dead animals), young hares, hedgehogs, mice, rats, reptiles, and squirrels. Body length of 21 - 27 inches. Color: Their youth are rich brown with golden edges around feathers. 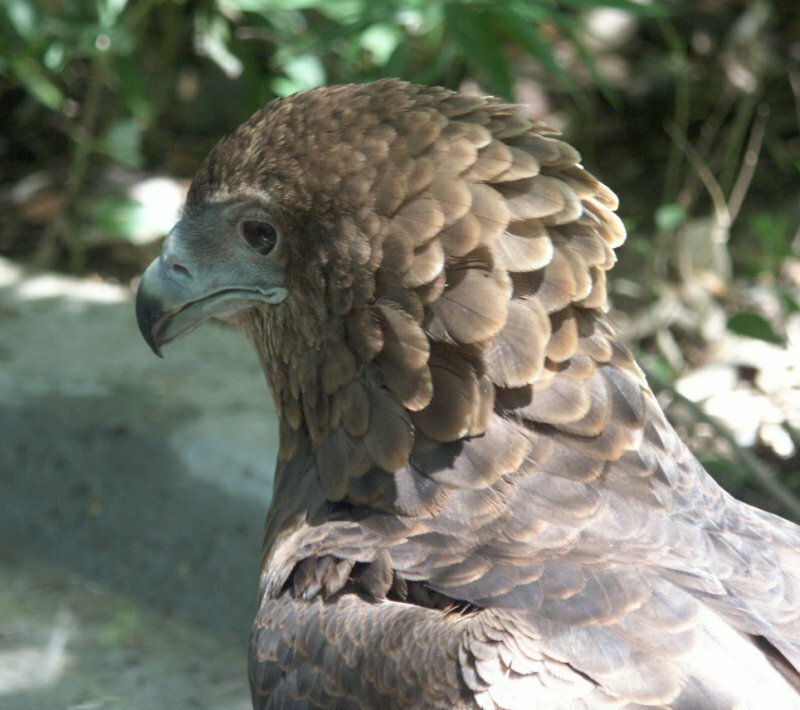 The adult Bateleur displays a black belly, head, neck, and wings, while their backs are red-brown. The adults legs are bright red. Feathers extend down to the toes. Eyes and tip of the beak are black. Males are often smaller than the females. Bateleur eagles pair for life, using the same nest and trees for several years. They lay one egg that has an incubation period of 52 -59 days. While the male Bateleur helps with incubation and feeding, it has been reported that only 2% of the chicks will make it to adulthood. Of those that make it to adulthood, they may live another 20-25 years. Since the Bateleur has a short tail, it rocks back and forth as a means of steering. From the seeming balancing act of its flying, the Bateleur gets its name from the French word meaning "tightrope-walker." The Fort Worth Zoo now has two Bateleur eagles, one still in juvenile plumage, as you see in the bird on the left, and one with adult plumage, seen in the bird on the right. The Bateleur eagle of the Fort Worth Zoo likes to perch in the shade, watching all of the people walk beneath it. Instead of perching on a tree, it chose to perch on the fence that covered the walkway through Raptor Canyon. At times, it seemed as though the Bateleur eagle was communicating with the Harpy eagle that is located directly across the walkway. The Child's World, Inc. , 2000.